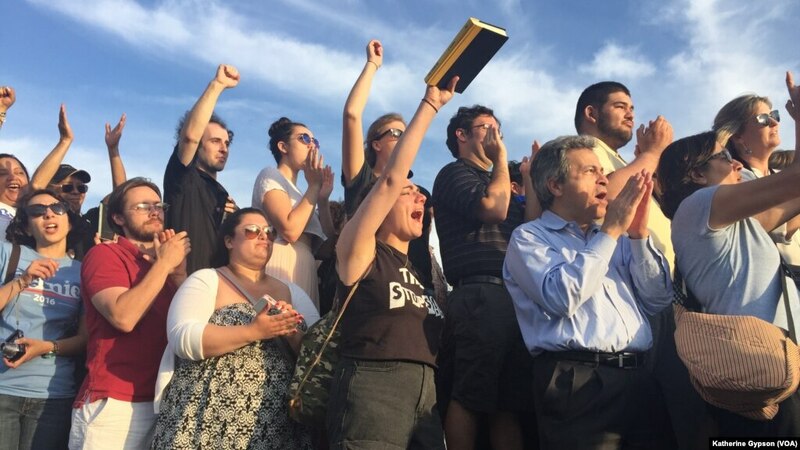 Supporters cheer as Democratic presidential candidate Bernie Sanders speaks outside R.F.K. Stadium, in southeast Washington, June 9, 2016. Debby Hanrahan isn’t worried about Bernie Sanders. She wants to know what Hillary Clinton, the presumptive Democratic presidential nominee, will do next. Hanrahan is one of about 1,500 Sanders supporters who turned out to see the Vermont Senator campaign for the District of Columbia primary vote. 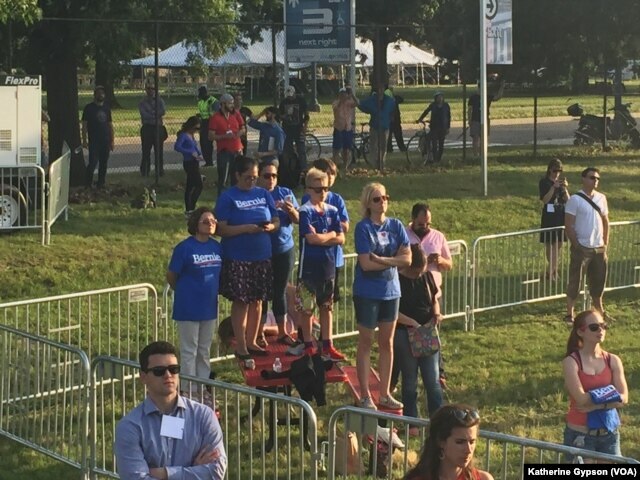 College kids in Bernie meme-friendly T-shirts stake out spots close to the podium, while the older, grayer voters who remember other revolutions wait at picnic benches in the shade. 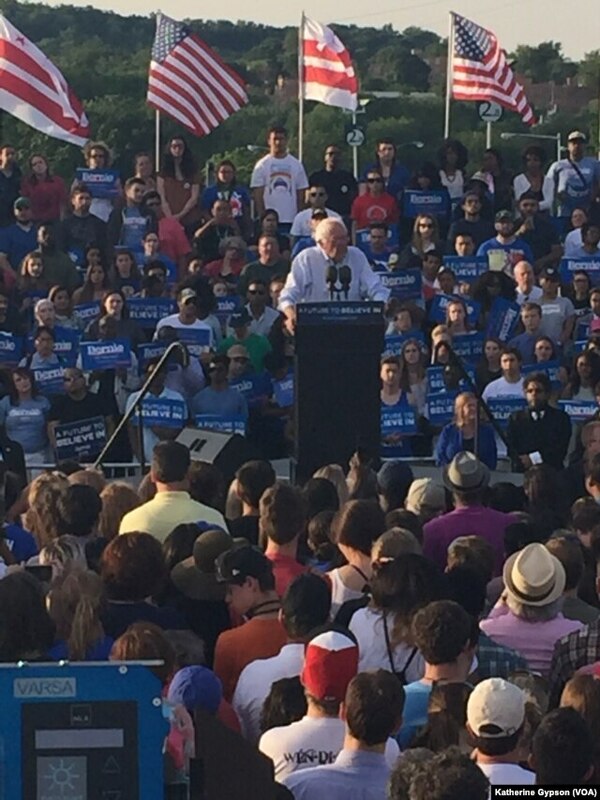 The unspoken reality is that this is Sanders’ final campaign rally. The movement that packed tens of thousands into arenas through the winter and into spring is ending in a skateboard park by a forgotten sports stadium in southeast D.C. on a cool June night. After a night of primary contests held from New Jersey to California, Clinton secured the delegates needed for the party nomination and declared victory on Tuesday night. Thursday morning, President Barack Obama met with Sanders at the White House and then endorsed Clinton hours later. But the Sanders supporters gathered here won’t talk about the campaign's ending. They talk about the movement's continuing on and what Clinton will do to address their political revolution. “I expect that my husband and I, and millions of other people, will not stand for business as usual. We’re going to demand more from Hillary Clinton if she wants out vote,” Hanrahan said. “I intend to push her as far as I can with letters and questions and talking to her supporters. She has got to change course – she cannot be the pro-endless-war candidate,” she said. Democratic presidential candidate Bernie Sanders speaks to supporters at a rally in a parking lot at R.F.K. Stadium, in southeast Washington, June 9, 2016. Trump is the presumptive Republican presidential nominee. Don and his wife, Estrella, said they had no problem voting for Clinton. “Hopefully, he’ll [Sanders] be a thorn in her side and force her to change her policies,” Don said. But just as Trump has forced the Republican Party to question its values and identity, Sanders’ candidacy has revealed cracks in the Democratic Party. Irv said the movement has developed because voters are starting to understand the changes in the way of life in the United States, and the political system hasn’t caught up to those changes. For Irv, that makes a vote for Clinton impossible. The older Sanders voters seem more resigned to the reality of the loss, worrying about the strength of the movement while the younger voters remain focused on choosing a candidate. Eli, a younger voter from Maryland, said he would probably sign up to volunteer for the Clinton campaign. Supporters gather to hear Democratic presidential candidate Bernie Sanders speak outside R.F.K. Stadium, in southeast Washington, June 9, 2016. Many supporters waiting in line ignore questions about Obama’s endorsement of Clinton or simply answer that they will vote for Sanders in November anyway. In many ways, Sanders’ speech echoes that desire. The events earlier in the day at the White House do little to change the standard themes that have appeared in every Sanders stump speech since he gave a low-key press conference to announce his candidacy last April. He doesn’t mention Clinton at all. But Sanders does set a goal many in the crowd say has to happen: find a way to beat Donald Trump in November. The Sanders supporters at the rally who will vote for Clinton almost uniformly cannot justify their choice without mentioning Trump. “If he makes it through, definitely Bernie,” said Daniella, a young woman in a “Feel the Bern” T-shirt. It’s as if the election cycle in the U.S. has forced another broken idea on the voters – a candidate they don’t want. Standing here in the parking lot, part of a much smaller crowd, they still want Sanders and all that he represents to them. Outside the rally, supporters picked over a table filled with “Bernie Revolution” T-shirts selling for full price. For the time being, the revolution still needs to be clothed.